ISUP offers an arrival service from 9:00 am to 9:00 pm on Friday, 21 June 2019. We will rent a location at a hotel at the airport where you will receive your CBS Housing key, you will get assisted transport to the dormitories, and will receive a big warm welcome from the ISUP crew. You will receive an email around May with more information. Please contact our Arrival Coordinator if you arrive earlier or later than 9:00 am to 9:00 pm on 21 June 2019, and if you need to receive a key to your CBS accommodation. Please note that if you arrive in the weekend or after 9:00 pm on 21 June 2019, you will have to wait until Monday to get your accommodation key. The ISUP Social Programme is an interesting cultural and social programme, specially targeted at international students participating in ISUP. The programme aim to ease and introduce international participants to each other, Copenhagen and the Danish culture through specially arranged activities such as guided city tours around Copenhagen, Danish folk-dancing, comedy night, as well as a weekend trip around Denmark. The Social Programme Coordinators will send all international students, enroled at ISUP, an email with detailed information in May/early June 2019. Please contact our Social Programme Coordinators for further information. Each element of the ISUP Social Programme can exclusively be purchased through the CBS Webshop where they will be available for sale in the beginning of June. Please note that the ISUP Social Programme is a package deal and the individual events cannot be bought individually, however, the weekend trip around Denmark is sold separately. You will receive an email when the sales open including the promotion material. In 2018 the price of the social package was DKK 675, and the price for the weekend trip around Denmark was DKK 1,695. ISUP Social Programme Coordinators will arrange a Welcome Day 22 June 2019 for all international students. 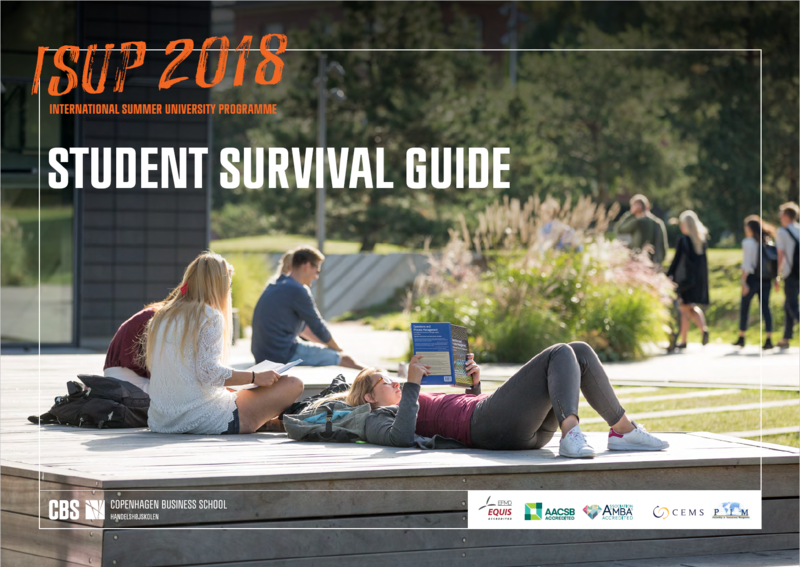 The ISUP Social Programme Coordinators have arranged for a all students a guide sightseeing tour around the city center of Copenhagen on Sunday 24 June 2018 at 13:00. Meeting place is Kongens Nytorv in front of the Metro station and Magasin department store. The Sightseeing Tour is free for all students. For those students who have signed up and paid for the Social Programme package the Sightseeing Tous is followed by a Canal Tour around the canals of Copenhagen. During the Introduction meeting you will get important information about different aspects of ISUP. Courses and exams, incl. timetable, active participation, Online Student Service system, CBS Learn, supplementary courses, payment issues, preliminary and feedback assignments, exam rules, de-registration from the exam, Danish grading scale, transcripts, library and study rooms etc. Summer in Copenhagen is definitely worth considering when the city is Copenhagen where the streets are filled with sidewalk cafés and the midnight sky is never darker than a deep blue. You can walk the winding streets of the old city centre or see it from a canal boat. Visit the 175-year old amusement park Tivoli Gardens, the statues of the Little Mermaid and H.C. Andersen, the freetown of Christiania and Amalienborg - home to the royal family. Copenhagen is also a city of innovation, modern architecture and design. Experience prominent Danish designers, such as Georg Jensen, Hans J. Wegner, Finn Juhl and Arne Jacobsen. Start your visit at the city of Copenhagen's website. Copenhagen is a bustling city full of ambitious professionals and young families. Yet working long hours here is frowned upon. Just 2% of employees in Copenhagen work 40 hours a week or more, according to an OECD report, freeing them up to spend time with family, join organized sports, volunteer or participate in other community programmes. The cost to participate in those programmes, which range from laughter yoga in the park to basket weaving? Free. This helps encourage residents to get involved. Their ability to balance work with quality time with friends and family not only keeps their stress levels down, it gives them a happiness boost. Studies show that people who focus on experiences versus things have higher levels of satisfaction long after the moment has passed. Other things play into Copenhagen's relaxed atmosphere. Residents walk to restaurants and walk to get groceries. There are outdoor food markets with fresh produce and vegetables within a few blocks of most spots in the city. Men cycle to work in their slim-fit suits, and women don’t shy away from pairing a bike helmet with their sundresses and wedge heels. The city has around 390 kilometers of bike paths, which makes biking an easy and safe option. And people use them: Nearly half of commuters in Copenhagen travel to work or school by bike each day. Here’s one more stat that may make you want to start packing your bags for Denmark: 96% of residents in Copenhagen say they can count on someone if they are in need. This supportive society is just another reason Copenhagen earns a spot as one of the healthiest (and happiest) cities. Denmark has taken the top spot as the happiest nation in the United Nation's World Happiness Report multiple times, latest in 2013, 2014 and 2016. Denmark came in first place as the happiest country in the world in the 2016 happiness report and one of the happiest places in Denmark must surely be Tivoli Gardens. One of the world's oldest amusement parks, Tivoli Gardens is open to throngs of native and foreign visitors. If a calmer Copenhagen is more your preference, visit the King's Garden at Rosenborg Castle, a popular spot for locals to picnic during the summertime. So, why not travel to one of the happiest countries with an open mind and a loving heart, and pick up on that Danish spirit of "hygge," which is sometimes translated too simply as the Danish need for "cosiness." It's really a more complex sense of intimacy, community and contentment that generally happens with friends and family. What is Denmark also famous for? Søren Kierkegaard (philosopher and the father of existentialism).